Portability never looked like this. Weighing in at a mere 20 ounces with batteries, the lightweight, stylish *ist D does not sacrifice quality and performance. A 6.1 megapixel CCD with advanced data processing circuitry for astonishing image clarity and detail. A newly-developed 11 point autofocus with SAFOX Vlll for quick and accurate focus. A bright, high-precision viewfinder with superimposed AF-point display for super-clear views of any subject. And featuring a PENTAX K lens mount for compatibility with most existing PENTAX 35mm format lenses and accessories. All protected by a super-rigid, black stainless-steel chassis. Portable and maneuverable, the *ist D is the ideal go-anywhere traveling companion for advanced amateurs and photography enthusiasts. This bundle includes PENTAX lens. 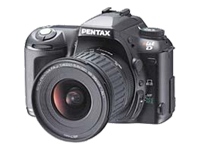 The PENTAX smc P-DA J 16-45mm F4.0 ED/AL is recommended for use with digital cameras. It features a 3X zoom ratio with focal lengths covering ultra-wide angle to normal ranges, incorporates a high-refraction extra low dispersion (ED) glass element to produce a high-resolution, high-contrast image with true-to-life color rendition, and aspherical lens elements to help transmit the light more efficiently through the lens to the film. The smc P-DA J 16-45mm F4.0 ED/AL is well suited for advanced amateurs and professionals.